UK-DC are one of Gloucestershire’s premier building construction companies working for both domestic and commercial clients in the County and beyond. With a strong ethos for delivering quality workmanship at competitive prices, UK-DC offer a full range of services and are happy to manage the project from start to finish, or just provide partial works if that’s what the client requires. UK-DC are happy to work on small or large projects and are equally happy constructing a new build as we are building a garden wall for a client. 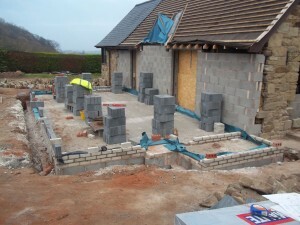 Garden building works including walls, fencing, patios & driveways. Specialist trade services including roofing, electricians, plumbing & heating specialists. If you have a building project in Gloucestershire or the surrounding Counties that needs to be delivered on time, with excellent workmanship and at a competitive price then why not ask UK-DC for a free no-obligation quotations? We guarantee you won’t be disappointed with our service, price or workmanship.